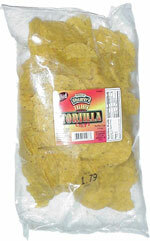 Taste test: These are thin, round yellow tortilla chips. They've got a medium level of salt, but otherwise no special flavoring. They're good, and the corn flavor is quite tasty. Smell test: Good tortilla chips smell.